Spring Honors Convocation is an invitation-only event celebrating students' academic achievements. It will be held at 3:00 p.m. in Draddy Gymnasium. The Class of 2019 Mass will be held on Thursday, May 16, 2019 at 6:15 p.m. in Draddy Gymnasium. The Mass is a non-ticketed event so all students and their guests are encouraged to attend. Following the Baccalaureate Mass, a buffet reception for the Class of 2019 graduates and their guests will be held on the Quadrangle. Entertainment will feature the Manhattan College Jazz Band and Singers. Tickets will be required to attend the commencement ceremony. There is no charge for tickets and each graduate will receive a limited number of tickets. Graduation announcements, 4 tickets, 1 parking pass and instructions for commencement will be distributed from the dean’s office of your school beginning Tuesday, April 16 through Friday, May 3. Extended hours will be offered at the Office of Student Accounts & Bursar Services, between 4:30 p.m. and 7 p.m. on Thursday, May 2. The undergraduate commencement ceremony will be live-streamed in the Great Room of the Kelly Student Commons, Hayden 100, and the Capalbo Room (DLS 300). Beginning Tuesday, April 23 at 9:30 a.m., extra viewing tickets will be distributed from the deans’ offices on a first-come, first-serve basis. The limit is 2 extra viewing tickets per student. Pay all Fees: Pay a graduation fee, if you have not already done so, and any other outstanding tuition balances. Exit Counseling: Online exit counseling is required if you borrowed federal loans (Stafford and/or Perkins) and/or the TEACH Grant. Students will be sent instructions by email and can refer to the Financial Aid exit counseling page. Graduation Clearance Checklist: Please log on to Self-Service beginning Monday, April 15 to review your customized graduation clearance checklist. Your checklist outlines the requirements you need to complete BEFORE you are eligible to claim your graduation tickets at the dean's office. * Please note that alcoholic beverages are not permitted at this event. Only students who have been cleared to graduate will be provided academic attire. There is no additional charge for your cap and gown, and you do not have to return it after the ceremony. Cap and gown distribution will begin at the Graduation Fair to be held on April 16. If you cannot attend the Graduation Fair, you may pick up your cap and gown from the bookstore beginning April 17 during normal business hours. 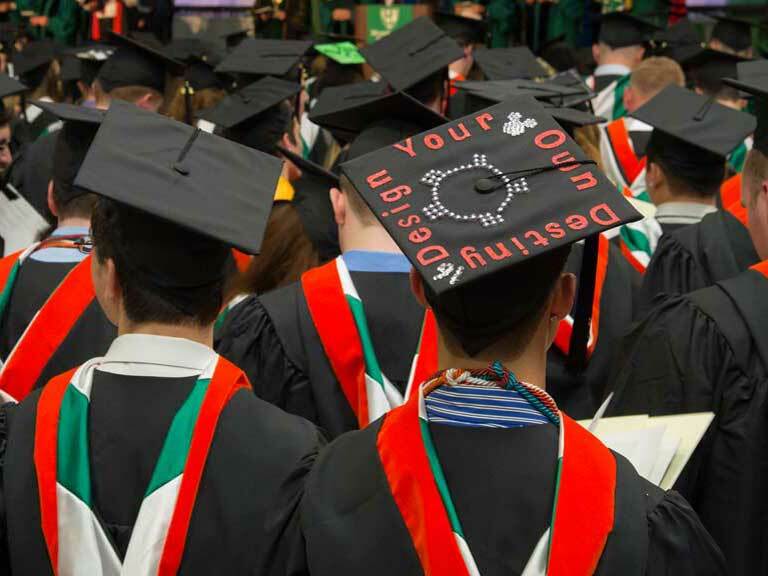 Recognized clubs and academic honor societies may apply for permission to wear cords at commencement by emailing the Office of the Provost at commencementcords@manhattan.edu. Immediately following commencement, students (only) will be asked to report to the following areas in cap and gown to pick up diplomas. After you pick up your diploma, students are asked to join their guests at the post-commencement reception, which will be held on the Quaddrangle for all schools. Each graduating student will receive formal printed graduation announcements. These are distributed with the tickets. Manhattan College sends out notices to the hometown newspapers for all graduating students. If you're graduating this year but do not wish to have an announcement sent to your local paper, please email public_relations@manhattan.edu no later than May 14, 2019. Manhattan College has several official photographers taking photos for all commencement events, Spring Honors Convovation and the Baccalaureate Mass. Each student will have their photo taken during the commencement ceremony as they cross the stage. Proofs of these photos and purchase options will be emailed to each student a few days following commencement. College photographers will be taking photos throughout commencement day. These photos will be posted to www.manhattan.photoshelter.com a few days after the event. High resolution photos can be downloaded free of charge. Guests who will be taking photographs during commencement may not enter the aisles at any time during the academic procession. Also, no one is permitted to enter the student seating area for any reason. Please be mindful not to obstruct the view of other guests as you are taking photos. Guests can photograph any part of the procession outside the gym, on Walsh Plaza, or behind general seating areas. Before or after the ceremony, you are welcome to take photos anywhere on campus that is publicly accessible. All graduating undergraduate students can take a senior portrait. The senior portrait photographer is on campus during the Graduation Fair. Additionally, there is usually one make-up day when the photographer is also available. For more information, please contact the Office of Student Engagement at studentengagement@manhattan.edu.